It appears TfL have made some mistakes with changes to buses in Woolwich town centre which could leave passengers stranded. Before Crossrail (or the Elizabeth Line) was delayed a whole bunch of changes were planned for early December 2018. In the event, many have been postponed with only the conversion to double decker of the 291 and 178 occurring. Yet someone at TfL has been switching bus stops around in Woolwich town centre before bus changes have occurred. For example, four stops that the 386 called have now been removed from bus stops. 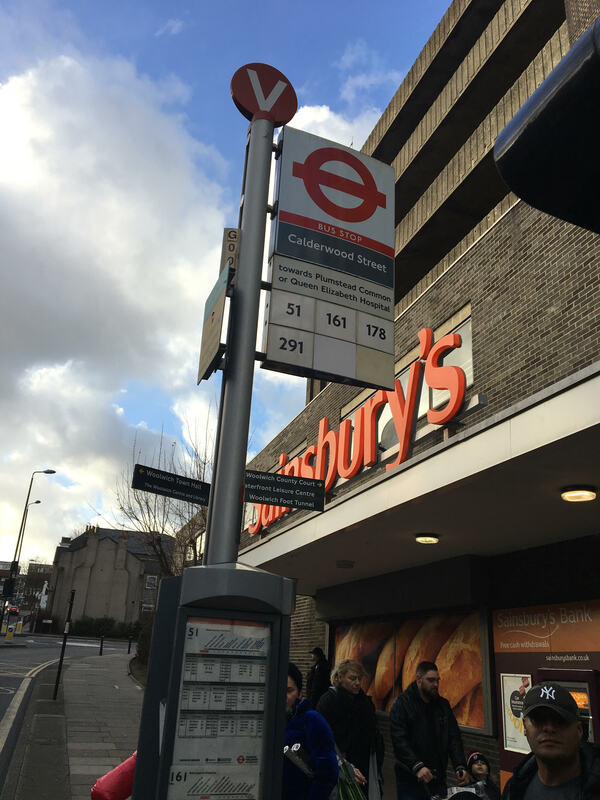 The first is now the busy Vincent Road stop meaning no signs are up at busy stops across Woolwich town centre including Hare Street and Calderwood Street outside Sainsbury’s. 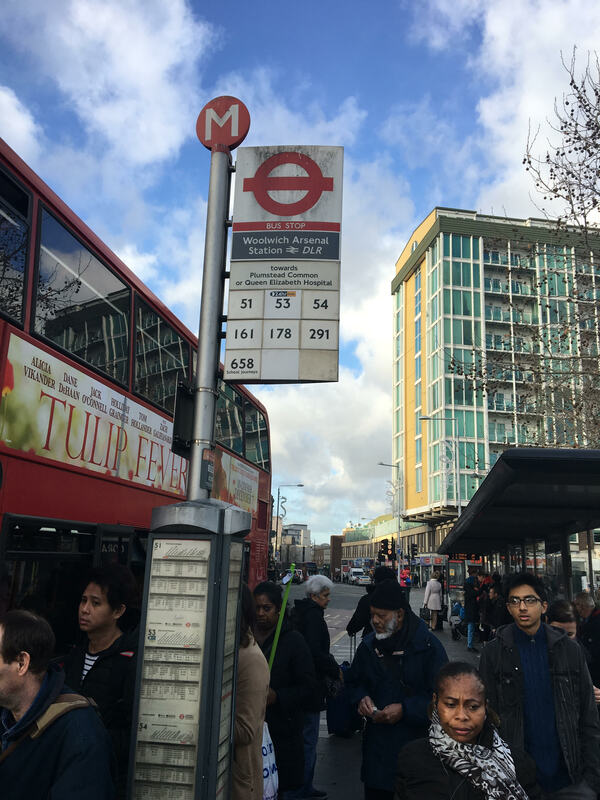 Elsewhere, the 161 is now shown on the stop by Woolwich Arsenal station yet these changes are not due to take effect until March. Hopefully TfL rectify the issue quickly having been informed. Bus use is already falling in London costing TfL money. Messing up signs for three routes at numerous stops in a major town centre will cause obvious issues for passengers. I knew something was up. There was a lost soul pottering around looking for the real 161 stop the other day. The loss of 4 stops on the 386 was not covered in the consultation on the changes. It should have have been. A driver a the garage has seen the new route record. Losing the four stops is happening unless we kick up a fuss. Change due in March. The buses are going to share the 54 stand outside the covered market. They will then turn left into Woolwich New Road and left into Vincent Road. This will cause serious delays as a bus load gets on. 161 hasn’t changed yet. Delayed until March. The 386 can’t turn left either.That is the problem. I objected to the planned changes for 161 turning left after stopping by Tesco (new) into Thomas Street then turning left into Wellington Street stopping at Woolwich Centre then turning right into John Wilson Street to Ferry roundabout to take up line of route from there. When I suggested as currently doing Vincent Road, Barrage Road, it would cost an extra bus to maintain timetable. It seems to be working just fine at present. !!!!!! It is a shame that route 386 will no longer be serving Sainsburys on Calderwood Street if the changes go a head to route 386 March/ These change will affect a lot of people living in Plumstead. A lot of people got on at the Sainsburys bus stop and went to bus stops on Bloomfield Road and to bus stops along Herbert Road, I guess they will have to get the 51 to Bloomfield Road and then walk. However, this is not good for local residents many of whom are elderly disabled or have small children and shopping to carry.